The second day of the Artisan II workshop was spent mostly baking the breads for which we had fed the levains and scaled the ingredients yesterday. We also mixed levains and scaled for tomorrows bakes. Classroom time was bits and pieces between dough foldings and during fermentation, but the content was very good. The instructional goal of today's baking was to see the effects of different types and proportions of levains on flavor. We baked four breads which differed only in these respects. Bread made with a levain fed once a day. (All the others were made with levain fed twice a day.) This bread was notably more sour than any of the others. Bread made with liquid levain at 100% hydration. (All the others were made with firm levain at 50% hydration.) This bread had notably less acetic acid tang and a noticeable milky lactic acid flavor – very pleasant. Bread made with 40% firm levain. Bread made with 70% firm levain. The last two were not very different from each other in sourdough tang, but the 70% levain bread had a less pleasant, “metallic” after taste, according to some. I didn't perceive the after taste myself. The main take away lesson was that the frequency of starter feeding has more impact on bread flavor than the amount of levain used in the final dough and that the use of liquid versus firm starter really does make a difference in the balance of acetic versus lactic acid flavor in the bread. 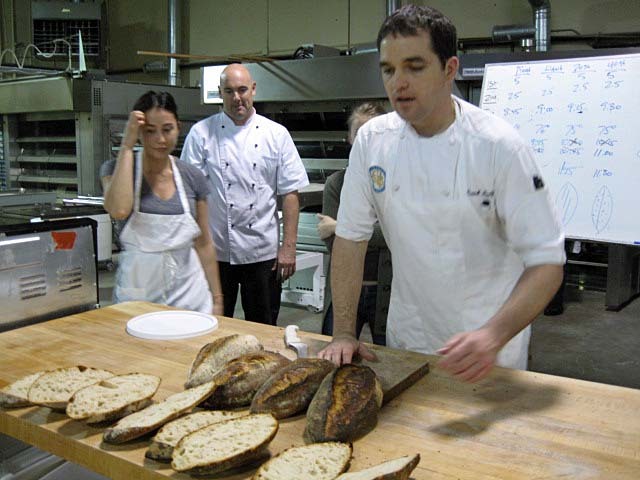 In the classroom today, Frank reviewed the application of baker's math to breads made with levains and the SFBI's recommendations for levain maintenance for home bakers. I won't go over the baker's math topic, but I'm sure the recommendations for levain maintenance are of interest to many. The SFBI staff clearly favors keeping liquid levains and twice a day feedings. They also favor keeping your mother/stock starter at 400-500 g. They say smaller amounts result in poorer flavor. However, they also favor feeding your starter in a manner which minimizes the amount of starter you end up discarding. This is accomplished by determining exactly how much starter to feed to get the amount of levain you need to make your dough and not making too much excess. Again, it is recommended that you feed every 12 hours and that you do two feeding prior to mixing your final dough. And refrigerate this immediately after the feeding. Activation prior to baking should done with 2 feedings (as described above) at 12 hour intervals. In other words, to mix a dough on Saturday morning, the refrigerated starter should be fed Friday morning and Friday evening. At the lunch break, I asked Frank about the formula for miche in AB&P which violates almost all these recommendations. I have described this previously in my TFL blog. He thought this was interesting enough to provide the answer in the next class session. While today's breads were baking, we mixed the levains and scaled ingredients for tomorrow's bakes. 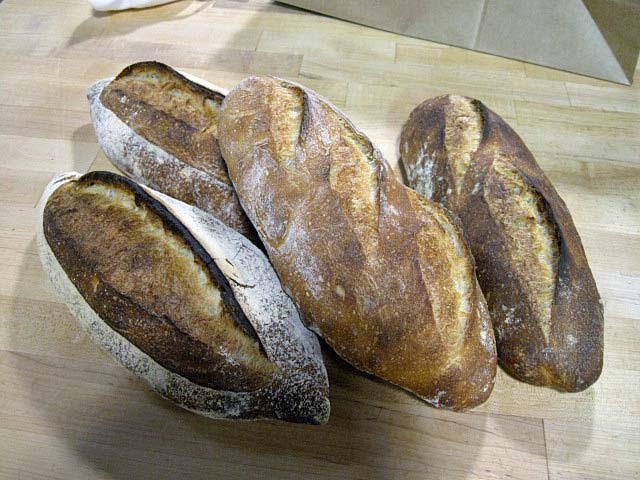 We will be baking a variety of breads with levain that were made with commercial yeast during the Artisan I class: A whole wheat bread, multi-grain bread, rye bread and challah. We also fed our “from scratch” starters with which we will make breads Friday. Thanks for the detailed reporting, David. I am reading it with great interest. Beautiful pictures and great write-up, David! Very interesting to read, both day 1 and day 2 summaries, David. Thanks for sharing your experience with us! Are the formulas you work through identical to those in ABAP, or do the SFBI staff use different material when teaching the course? Interesting to hear about how levain feeding impacts the bread flavour. What about crumb structure? Did you notice any visible differences in the crumb for the two? Regarding crumb structure: All the breads had a lovely open crumb structure and that wonderful cool mouth feel. There was no significant difference among the formulas that I could discern. I think I heard Frank remark on this, in fact. Thanks so much for that excellent rundown on Day 2. I was agreeably surprised to learn that I am doing most things 'right', which I think is largely due to prolonged exposure to the fabbo information people share so generously on this site, and taking notes each bake over a prolonged period of time. Your observations on the flavour of breads made from 100% hydration starters equate precisely with mine. Very interesting that the SFBI recommends kept starters have a minimum weight of 500gm to optimise flavour. Hadn't come across that before. Illuminating background to the Suas miche. Hanging out for your report tomorrow! You must have to push yourself to write out a comprehensive report for our benefit at the end of an intense day of learning and baking. Much appreciated. Day two sounds like where the fun really begins David. I can't thank you enough for this awesome coverage! These refinements, especially for starter maintenance, and levain building will help me tweak those techniques that have evolved from my trials and errors. I'd love to attend an SFBI workshop, but 1) I don't want to begin with breadbaking 101: I think I'm past that stage, but I understand I would have to take SFBI stage 1, before I could take what you're taking now; and, 2) we've got our next two years of travel planned, and it would be unfair for me to usurp a shared trip. Consequently, I'm enjoying--too small a word--I'm lusting after all the detailed knowledge you can share during your week in San Francisco. When I was still working I traveled the world; San Francisco remained one of my few favorite cities. I envy your experience. Keep the posts coming. I know you are writing this after a hard day's baking, but I'm a bit confused about the formulas for the four breads. Numbers 3 and 4 are made with a firm levain (50% hydration) - the 40 and 70 % refer to - well that's the question - 40% of the total dough weight was the levain- or - ? "My teacher" once extolled the virtues of keeping a larger quantity of storage starter. And of course, I've always followed that policy, but have kind of "let it go" on these pages as so many people are concerned about "wasting" flour. I was glad to see the theme recur with another perspective. 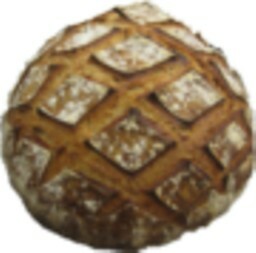 The levain percentages are baker's percentages. So, "40% levain" means that the weight of the levain in the final dough equals 40% of the total dry flour in the final dough. Re. "wasting flour:" In the bakery, wasting 200 g of starter is not so much, considering you are mixing many Kg of starter at a time. As I said to your next post - wow. That is most definitely unexpected bakers math. Really. The Bread Baker's Guild of America - among whose membership are people affiliated with SFBI - has standardized differently. Good thing it's you and not me attending that class. I can't wait to hear the explanation for this. I've done my own analysis of the meaning of "waste" and I find that, for me, the expense of keeping my levain "bake ready" so that during the all too brief periods that I am home I can actually bake is not really a waste. However I have found that many people on this forum are very sensitive to spending the extra money and the debate will become too passionate for me to advocate keeping the quantity of levain that I do. Great to read your recap! Sounds like you are getting results consistent with my experiments with starter hydration. But i had not tried the feeding variation. Appreciate your sharing! One question I would ask relates to how "hard" they are finishing the bread - i.e. to what internal temperature.I am suspecting 208-209 from your comments. Or are they measuring that! I am looking forward to my trip to SFBI this summer and learning how to form a baguette "properly". I must say I have also had better results with keeping a larger starter. I have always wondered how the people who keep walnut sized starters in the fridge manage to get any life out of them after long storage. It just seems logical that there wouldn't be enough food to sustain them over a long-ish period of time. My starter is never less than 250g (50g starter, 100g flour and 100g water) and often it will be as much as 375g ( 75:150:150). I find the larger the amount of starter the quicker it doubles. With these figures, and in our very warm climate, my starter doubles in 3 hours, triples in 4 and quadruples in 5-6. If I keep it out of the fridge in summer, I have to feed it 3-4 times a day. Naturally, I think it would be ideal not to have to refridgerate it, but it is just not practical. And unless you were using it all for baking, it would be too wasteful. However, I usually bake every weekend and always get good results with two, sometimes three (Thur. lunch, Friday night and Sat. morning) refreshes before baking. During the hot weather I find my starter is past its peak on Saturday morning after a Friday night refresh (even if it has only been six hours) and I have to refresh it again Saturday morning to mix the dough Saturday luncn time. Thanks so much for passing on your daily learnings. This is really quite an education you're getting (and we're receiving) on levains and the differences (subtle and large) that lurk within them. Thanks so much for taking the time to document your daily lessons. Thank you for this detailed discussion. I picked up something I must have misunderstood in my long distance learning out here in Hawaii. In the para. below the heading "For a firm levain feeding", you say: "And refrigerate this immediately after the feeding." I have had the impression that after feeding a starter one should let it double (or more) at room temperature, to the point where it loses its energy. At that point it gets refrigerated until needed. Are there different schools of thought on this, or have I just missed the point? I guess I could analyze the concept by thinking that the starter might need its feeding to work on during the relatively long refrigeration period. I'm a weekend baker, so optimally, I would like to feed only once or twice a week. Your interpretation would be a great help. The SFBI method assumes you will be refrigerating the starter for a week without using it or feeding it. It is refrigerated right after mixing. Note that it is going to be activated with at least 2 feedings before mixing the dough for a bread. The "bake once a week" regieme works well with the rest of my life. This is very helpful in trying to maximize my starter performance. I enjoy significantly sour loaves, so I assume this long slow hibernation and cool temperatures might also favor the lactic (?) bacteria. You have answered so many of my questions about starters, thank you. I am wondering, after your SFBI classes, if you changed the starters you keep on hand, or the ingredients used in them?